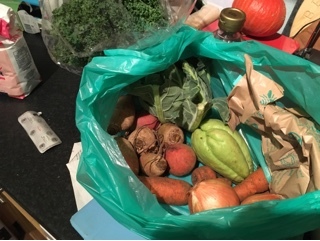 So last week was, there was a fair bit of eating out and my veg bag arrived. This week I got; kale, carrots, onions, cauliflower, chillis, beetroot and a chayote. I'm not really sure what a chayote is but I'll give it a go! 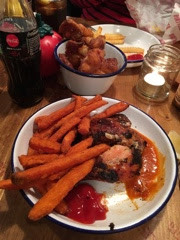 On Thursday I went to Dirty Burger/Chicken Shop in Crouch End with a friend. I had the chicken with sweet potato fries and we shared onion fries. 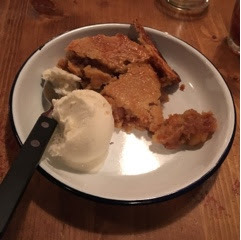 Then we had apple pie with ice cream for dessert. The food was delicious but the service wasn't great and the got the whole of my friends order wrong! 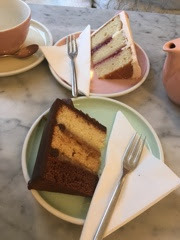 On Saturday I had cake. We were going to go to Dominic Ansell but when we went in the place felt a bit well, pretentious! So we went down the road to Peggy Porshen, which is just an emporium of pink glitteryness! Mush more our scene! We shared the salted caramel cake and the strawberry and champagne cake. Both of which were absolutely delicious. This week I am not going out for any meals, Monday will be a sandwich from Pret, apart from Thanksgiving, which I'm helping to cook at a friends house. I am really looking forward to it and have been tasked with green bean casserole and apple pie.